Unlike traditional bridges which are supported by surrounding teeth, implant-supported bridges attach to dental implants for a more natural-looking and stable result. An implant-supported bridge is often recommended when you are missing two or more teeth in a row. At Windermere Dental Group in Orlando, FL, Dr. Susana Moncada can perform implant placement and restore your implants with a custom-made bridge. Traditional dental bridges are designed to rest directly on the gums and remaining teeth for support. The two healthy teeth on either side of the gap must be altered to allow for placement of your restoration. 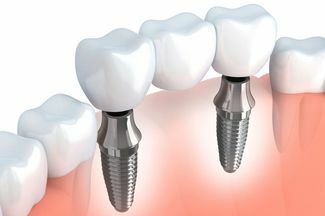 Implant-supported restorations, in contrast, are attached to small titanium posts embedded in your jaw. They mimic natural tooth roots, stimulating the jaw to prevent bone tissue degeneration and gum recession. Many patients who are candidates for partial dentures or a traditional bridge can find a more stable and lifelike solution with an implant-supported bridge. Since implants are so stable, they can provide unrivaled support for bridges. While dental implants do increase your treatment timeline and may raise the overall cost of restoring your smile, they offer many unique advantages over other restoration options. Before recommending implants, Dr. Moncada will assess your candidacy by performing a series of digital x-rays and scans. She will analyze the health of your jaw and determine if you have sufficient bone tissue to support the implant posts. If you have experienced substantial bone degeneration, you may be able to restore your candidacy with a preparatory procedure such as a bone graft or sinus lift. While a preliminary procedure may add to your treatment timeline, it can significantly decrease the chance of complications and help ensure a successful implant surgery. If you are not a candidate for dental implants, Dr. Moncada can talk to you about an alternative treatment plan. If you proceed with treatment, Dr. Moncada will perform a placement procedure to insert the posts into the jaw. Typically, for an implant-supported bridge, one implant is placed for each missing tooth. Most patients require three to six months to fully recover after implant post placement. During this time, the implants will fuse with the surrounding bone tissue until they are stable enough to support a restoration. Once you have recovered, Dr. Moncada will attach small connector pieces known as abutments to your implants. Then, we will take impressions of your smile and send them to an advanced dental laboratory. It usually takes a few weeks for a restoration to return from the lab. We may fit you with a temporary restoration to protect your implants while you wait. Once your bridge is complete, we will affix it to your implants for a fully restored smile. Many patients who are candidates for partial dentures or a traditional bridge can find a more stable and lifelike solution with an implant-supported bridge. With proper care, your dental implants can protect your oral health for many years to come. If you are interested in learning more about dental implants and the implant-supported restorations we offer, contact us online or call our office at (407) 294-1132 to schedule a consultation.